Holiday Penguins | MWAH! S&P Shakers Figurines | One Price Low Flat Shipping! Mwah! 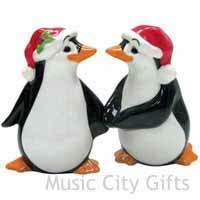 Salt & Pepper Shakers from Westland Giftware, Holiday Penguins. Made of ceramic. Measures 3.5" high. Hand wash only. This adorable set of jet black and snow white penguins are dressed in Santa hats making for delightful holiday decor! The male penguins hat features a holly berry and the female has detailed eyelashes. A strong small magnet holds these sweethearts together in big happy Mwah...SMOOCH!